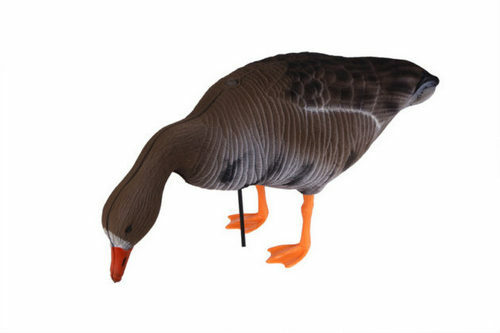 The most effective way to attract geese is to use high-quality full-size stuffed animals. Flat profiles give less results, but with skillful placement they are also useful. 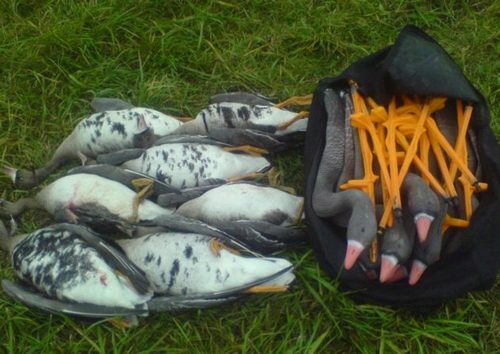 In any case, when hunting with a dummy you need to take into account many other circumstances, including wind direction, bird migration routes, wind direction and other factors. Consider the most popular models of stuffed animals offered by manufacturers. The model is made of Softplast frost-resistant plastic, designed specifically for crushed effigies of premium class. 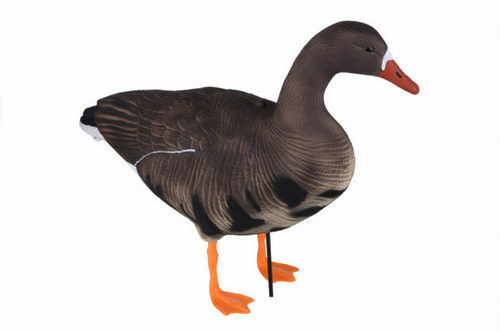 The structure of the plastic allows to realistically convey the natural shape of the goose. The material is durable and durable. Realistic color, high detail layout. Full restoration of the model in size and shape after crushing. The high strength of the product, achieved through high-quality soldering. Moisture resistance, resistance to low temperatures. Stability on soft ground and in wind gusts due to a special clamp. Effigy “Live pen” is available from 2017. For its production using soft crushable plastic Softplast. High-quality imitation of a live goose. Durability and durability of plastic. The small sizes of a model in folded form. The model does not glare in the sun. Scarecrow retains functionality at temperatures from 40 degrees of frost to 40 degrees heat. The support post is made of solid high-strength plastic. There is a washer-retainer holding the effigy on unstable soils. 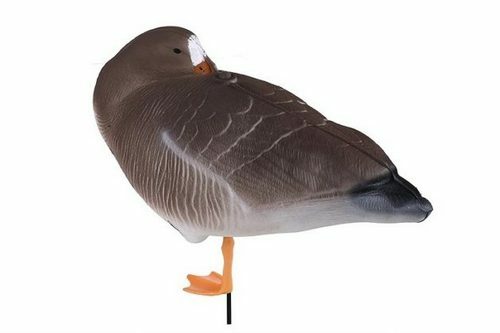 The effigy’s weight is 350 g. The kit includes 10 or more layouts, of which 8 imitations imitate feeding geese and 2 performing a guard function. The mock-up is produced by North Way. Premium goose dummies are made from crushed plastic. 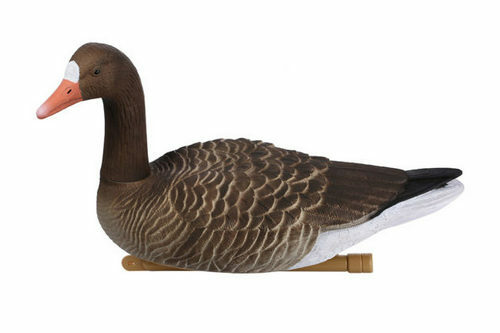 The structure of the material allows to reliably convey the shape of a real wild goose. High level of similarity of the layout with the goose. Scarecrow dimensions: height – 35 cm, width – 22 cm, length – 50 cm. Product weight – 650 g. The set consists of 6 models. The model of 2017 is made of SXPE material coated with a live pen anti-reflective coating. Deep relief allows you to achieve a high level of realism stuffed. Detailed smallest details for the most reliable imitation of the bird’s body. Painting a goose is done by hand. There were new poses for the “watchdog”, “feeding” and “resting” mock geese. Decorative paws are supplied to the model separately from the body, then the buyer himself attaches them. Effigy can be used as in severe frosts (up to minus forty), and in hot weather (up to 40 degrees Celsius). Store dummies should be straightened and suspended. Scarecrow’s weight is 160 g. Along with it, a 60-cm-long durable plastic stand is offered. The total number of stuffed animals in the set is 10, 6 of them represent feeding, 2 are guards and 2 more birds are resting. Scarecrow SuperXPE 3D – a novelty, which began production in 2017. Foam polypropylene is used as a material. Due to this, the mass of the product is seriously reduced. In addition, the material is better wrinkled when compared with plastic. All seams are soldered qualitatively. Deep relief allows you to emphasize the contours of the plumage. Achieve a high level of detailing plumage. Increased a variety of anatomical postures. New poses have appeared for all types of stuffed animals imitating nursing, guard and sleeping wild geese. The weight of each model is 180 g. Scarecrows are supplied in a disassembled state, the paws are set independently. Also offered 60-cm support rack. From 10 geese in a set 6 feeding, 2 act as watchmen and 2 have a rest. 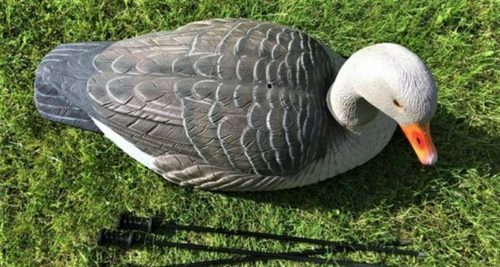 One of the latest innovations is the effigy of the White-cheated Goose. The release started in 2018. Lively motion layout in windy weather. Durability and crushing of a model. Scarecrow dimensions: height – 35 cm, width – 23 cm, length – 52 cm. In this 2016 model, the Living Pen technology was introduced for the first time. The essence of the technological process consists in flock spraying of a large amount of pile on the surface. The product is impregnated with special dyes. The result is a reliable glow of the layout in the ultraviolet spectrum. Villi absorb a significant amount of sunlight, as a result there are no glare. When palpating the coating it seems that it is made of velvet. Frost-resistant material with a water-repellent coating. Izolonova basis, through which the model is both flexible and durable. The design is easy to finish after crushing. The effigy is completed with reinforcing rings that are installed at the fixing points of the mounting drain, as well as decorative paws. 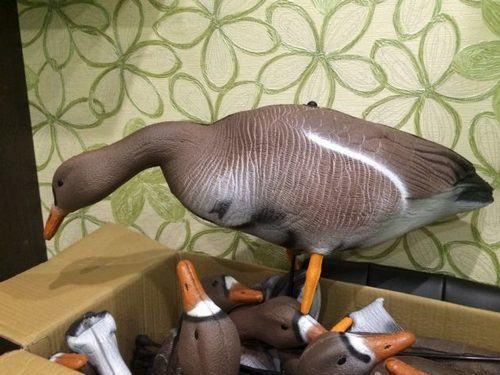 They propose three varieties of effigies imitating white-fronted geese, geese and bean goose. The weight of each model is 140 g.
The layout includes two parts – the torso and head. The buyer independently connects them with a cross member. On the surface of the model applied flock spraying “Live pen”. The main material is waterproof, durable fabric. Painting of an effigy is carried out using thermal printing technology. Very small dimensions. 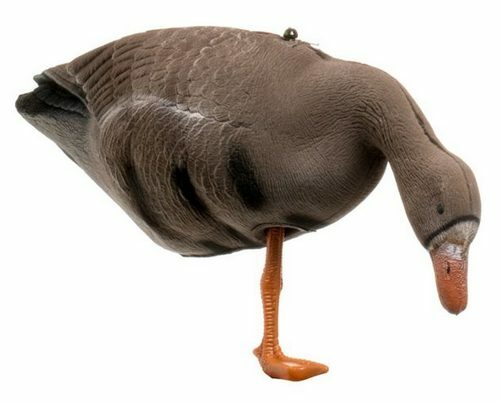 When folded, a stuffed white-fronted goose takes up five times less space than a full-sized goose. The weight of the layout is 90 g, which is the best indicator among analogs. Effigy moves even with very small wind. Movement gives the layout additional credibility. Includes 10 geese: 8 feeding and 2 guarding.